How Can Brands Combat Digital Advertising Fatigue? The internet offers the perfect platform for brands to advertise, with in-depth user data allowing them to target demographics and individuals in ways not possible with TV and print. However, have we reached saturation point? The ubiquity of online advertising means that many online ads are simply ignored. What’s worse for digital advertisers is that people aren’t just ignoring their ads: they’re actively getting annoyed with them. Annoyed enough to pay for the privilege of avoiding them. How can brands and advertisers counter this growing consumer trend? Advert-induced rage is nothing new. It has, however, reached fever pitch in the Internet Age. Such is our collective frustration with the constant barrage of messages that we’re going to increasing lengths to avoid being told what to buy. More than one in five British adults online are now using adblocking software, with adblocker usage worldwide apparently rising 90% last year. Apple has even introduced free browser extensions in iOS9 to help users avoid pesky brands trying to muscle in on their online time. Such is our collective frustration that more and more people are willing to pay a premium for ad-free content. YouTube recently introduced a new service, ‘YouTube Red’, allowing viewers to skip the ads for a monthly fee. 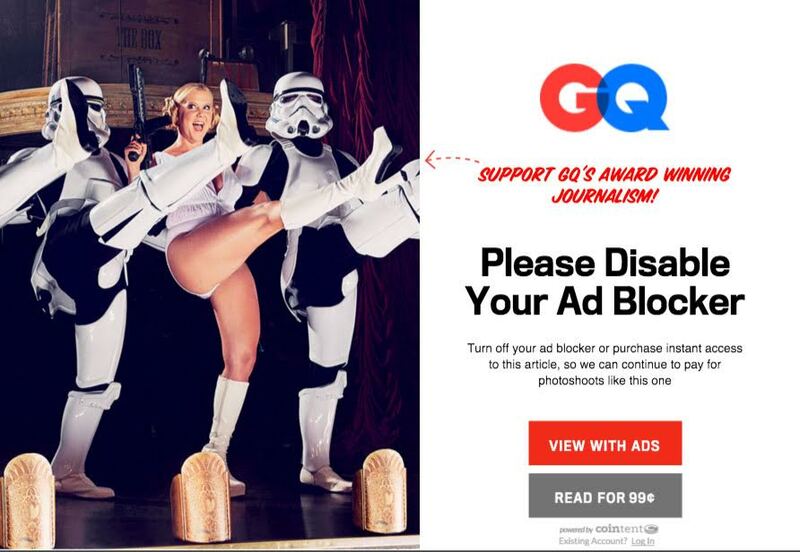 Condé Nast has taken a similar step, requesting a small fee from online GQ readers unwilling to disable their adblocker. Meanwhile, a recent survey suggested that almost 80% of Netflix users would rather pay more for the service than have to watch ads. In the face of this negativity, many brands and publishers alike may feel like simply packing it in. The advantages of digital advertising are, however, too good to ignore. How, then, can the digital advertising space be taken advantage of without chasing off potential new customers through sheer annoyance? Over the last decade, more targeted advertising has been seen as the answer. For years, cookies have allowed websites to store the browsing activity of visitors, giving them the chance to push ads targeted at specific users. Just try searching for legwarmers on Amazon and then see how many different websites try and sell them to you the next day. However, more often than not this targeting is too simplistic. If I’ve already been on Amazon looking for legwarmers, chances are I’ve already bought them, and will simply get annoyed if they try to sell me more. Online advertisers need to make better use of the tools available to them, creating more nuanced consumer profiles so that they are tapping into a consumer’s potential interests and influencing their shopping patterns, not just shoveling products back in their faces. In a world full of adblocking enthusiasts, even this may not be enough. Brands have to get smarter about how they reach cynical potential customers. One increasingly popular method is content marketing and native advertising. Instead of sticking an ad in the sidebar of a website, brands are now generating content that sits within the main body of the site. This allows them to lead a conversation, disguising their marketing message within relevant, longer form content. With purchase intent shown to be up to 53% higher with native advertising compared to banner ads, it is clear that brands yet to join in should be getting onboard. There is, however, a caveat. For content marketing to be effective, the content in question must be relevant. People are growing increasingly aware of native advertising, and will simply ignore it if it doesn’t carry the same credibility they expect from unsponsored content. In fact, 52% of consumers distrust sponsored content, regardless of the brand behind it. What is clear is that advertisers are fighting an uphill battle to be heard in an increasingly cynical world. The benefits available to brands looking to advertise online are plain for everyone to see, but the answer isn’t to mindlessly pump ads into the digital space. The rise of adblocking, ad-free paid-for content and consumer mistrust means that brands need to be smarter than ever to ensure their message is both heard and connected with.